Well, Monday was another day of uncertain weather and unreliable forecast, continuing the frustrating and nearly two-week-long pattern caused by a very persistent upper-level low pressure system lingering over the western United States. But it also looked like the last day of possibly decent weather before a frontal system moved in overnight and on Tuesday, ushering in a major pattern shift back to a more winter-like westerly flow for the remainder of the week. 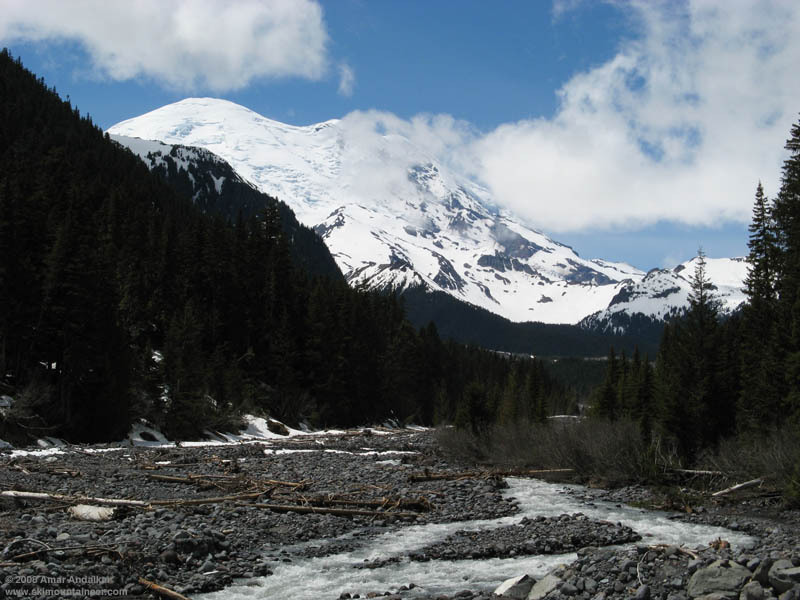 I really wanted to get out and ski, and had been planning to head to Inter Glacier on the northeast side of Rainier, since the road to White River Campground had just opened on Friday, May 30. However, gray skies in the morning did not look promising, and reviewing numerous mountain webcams confirmed that clouds and whiteout also reigned supreme in the mountains of Washington, while Mt Hood, the Three Sisters, and other peaks of the Oregon Cascades basked in glorious sunshine. Still, I strongly suspected that the skies might be clear above the cloud deck even in the WA Cascades. Then the 9:30am NWS forecast discussion was released and gave a few rays of hope: "SYNOPSIS...MORNING CLOUDS OVER WESTERN WASHINGTON WILL GIVE WAY TO MOSTLY SUNNY SKIES AS A WEAK RIDGE MOVES INLAND. . . . A ROUGHLY 6000 FT DEEP MARINE LAYER REMAINS OVER WESTERN WASHINGTON." Only 6000 ft deep, eh? I kept looking at the mountain webcams, and finally saw this at 10:30am: The Mountain poking its head above the clouds! the camera clock was an hour slow that day (has now been fixed). Time to head to Rainier, and FAST! I packed my stuff and was out the door just after 11am, even though a final glance at that webcam showed that the clouds had closed back in. A quick drive under almost entirely cloudy skies brought me to the first large areas of blue sky just inside the northeast park entrance by 12:45pm. I drove a half-mile past the turnoff to White River on SR 410 to the fine viewpoint looking up the river valley at Rainier: not bad at all, mostly sunny, a few clouds, but most of the Mountain was out! View from a half-mile south of the White River turnoff on SR 410. The clearest view of the whole day, at 1pm from just before White River CG. I reached the 4300 ft White River CG just after 1pm, and quickly geared up. It was late in the day, but sunset wasn't until 9pm and I figured I'd be able to reach Steamboat Prow (9700 ft) or Camp Schurman (9500 ft, but farther) in about 4 hours, leaving plenty of time to ski back down. But 10 minutes later, a friend showed up semi-unexpectedly, and we decided to head up together. 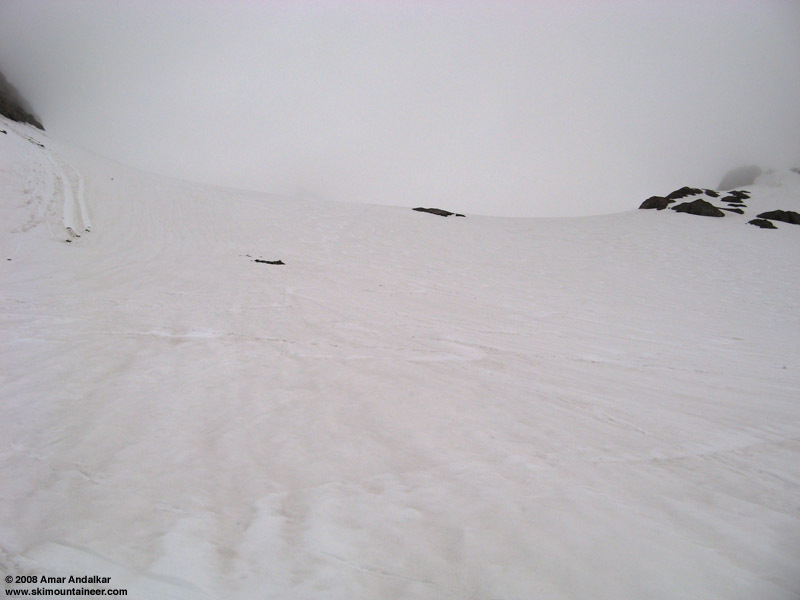 We finally started up the trail at 2pm, with me skinning up on 1-3 ft of very solid, continuous-looking snowpack. But alas, the first bare patch was only a quarter-mile away, and although I skinned across this and several others (including a wet creek crossing with an awkward fall), it was clear that skinning would soon be impossible on the flood-ravaged (Nov 2006) portions of the trail. We passed a couple of skiers hiking out, who confirmed that truly continuous snow lay almost 2 miles ahead, just after a large mudslide. So skis on the pack, and on up the temporary trail, marked with copious amounts of yellow "CAUTION" tape. 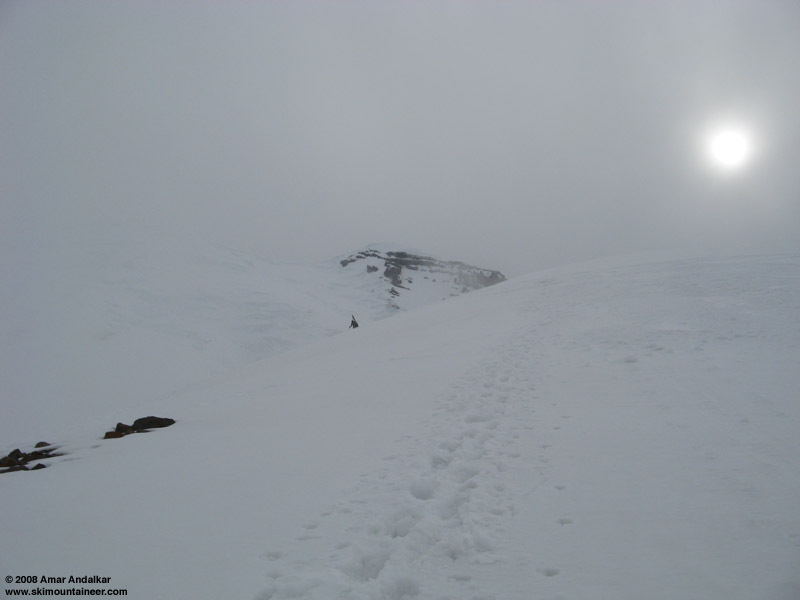 In general, the temporary sections of tread are in good shape, much better than the last time I went this way on July, 4, 2007 to ski the Emmons, and the trail presents little difficulty even for those carrying skis on the pack and hiking in ski boots. Mid-afternoon temperatures were not overly warm given the mix of sun and clouds, but the humidity was nearly 100% and so it was hard to avoid becoming a puddle of sweat during the hike. We reached the continuous snow after the mudslide near 5400 ft, continued hiking, and then skinned up from just before the Inter Fork White River creek crossing at 5600 ft at 3:30pm. All tracks were currently heading this way along the old mining road, instead of taking the sharp right switchback for the trail which leads to Glacier Basin CG. This creek crossing was very thinly bridged with snow, and in fact had collapsed into a 2-ft wide gap but the time I skied out a few hours later. Skinning across the Inter Fork of White River. Skinning conditions were excellent in the open basin, and we soon caught up to climbing ranger Chris Olson near 7000 ft, carrying a large pack with supplies for a 7-day stay at Camp Schurman. Chris had last seen me from the rescue helicopter during my Rainier epic 4 weeks earlier, and he had also skied the Kautz Glacier on a ranger patrol on Thursday, the day before my Kautz ski descent with Monika, Oyvind, and Dave. As we chatted, a group of four skiers skied down past us making nice turns in the late afternoon corn, they hadn't summited but had skied from above 12K on the Emmons route. Skinning up Glacier Basin, with the last break of blue skies overhead. After a snack break, the three of us headed up together. I managed to skin up the steep toe of the glacier to 8000 ft, but the other two had decided that the nice guide-service-emplaced bootpack was more efficient, and I soon concurred and put my skis on the pack. Snow conditions remained excellent for skinning or booting, 2-3" of softened corn on a firm base. But the weather had been worsening throughout the afternoon, and a dense whiteout was now in place above 8100 ft, making the security of the bootpack quite welcome. Climbing up in the whiteout. We broke out above the whiteout near 9000 ft, and reached the traverse onto the Emmons at 9100 ft by 6pm. No blue skies anymore though, as a layer of high clouds far above the summit of Rainier covered the entire sky, allowing only filtered sunshine through. The traverse onto the Emmons is in excellent shape, all snow and requiring a descent of only 50 ft or less (it even may be possible to cut it completely horizontally). Snow conditions were poor though on this steep, 40+ degree SE-facing aspect, with rotten sugary snow producing 2-3 ft deep postholes. Not wanting to continue to Schurman in the late hour, I said my goodbyes and booted straight up the face from the traverse, reaching the flat ridge beside Inter Glacier after a brief climb. Filtered sunshine and a view of the upper mountain, from 9000 ft just below the Inter-Emmons traverse. Panorama of the upper Emmons and Winthrop Glaciers from the Inter-Emmons traverse. The snow up here was in decent shape again, a solid firm carveable windpack, but given the marginal weather it didn't seem worth it to bother heading up the last few hundred feet to Steamboat Prow. I skied down from 9300 ft at 6:30pm, with the snow soon changing back to a nice layer of corn on a firm base. The whiteout remained dense from 9000 down to 8000 ft, but nevertheless the skiing was excellent and effortless on the very smooth surface and with nice corn, probably the easiest and best whiteout skiing I've ever done. The snow remained nice down below the whiteout to about 6500 ft, where it eventually became a bit sticky if you strayed outside the skin track. A quick schuss down the basin, then a slightly more interesting creek crossing than on the way up with the now 2-ft gap (although other bridged creek crossings are still possible, too), and then another schuss down the trail brought me to the mudslide at 5400 ft and the end of the continuous snow just before 7pm. Yes folks, the Emmons-Winthrop route still offers 9000 vertical feet of continuous skiing from the summit, and even if the creek crossings go soon, it should have a continuous 8800 feet for a few more weeks until the Inter-Emmons traverse melts out. Ski tracks below the whiteout on the Inter Glacier. Ski tracks continued on down the trail through numerous discontinuous snow patches for another half-mile and perhaps 300 vertical, but it really didn't look worth it. So I decided to just pack up and hoof it down the trail, reaching the car just after 8pm. The trail was completely deserted on this gray misty evening, and I saw no one at all on the entire trail or on the White River Road until reaching SR 410. By 9pm in Enumclaw, raindrops were hitting the windshield, proof positive of the incoming front and weather pattern shift. I'm so glad I took a chance on the weather and enjoyed another fine day (or evening) of skiing on the Mountain.